What Do Chinese Netizens Think of North Korea? 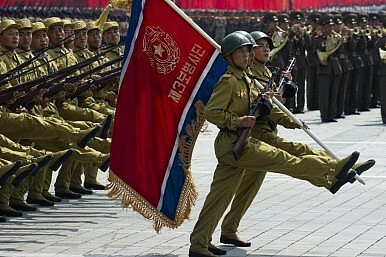 Chinese netizens believe North Korea’s current path is not sustainable. Given their shared history of struggle and common ideologies, the Democratic People’s Republic of Korea and the People’s Republic of China are blood brothers in a sense. Regardless of what the DPRK does, China will always be involved in some way. The online community seems particularly interested in the North Korea question as well as China-North Korea relations. In this spirit, I made a few posts on Weibo to conduct a mini-investigation into what Chinese netizens think about North Korea. Below I’ll briefly outline the responses I received. Regarding the future of North Korea, I posted the following question on Weibo: North Korean soldiers were seen carrying ‘nuclear backpacks’ during the parade. Kim Jong-un pledged that his country was ready to enter “any kind of war” with the United States. What are your thoughts? Do you support a nuclear war between North Korea and the U.S.? Do you support America using intercontinental ballistic missiles (ICBMs) to get rid of the North Koreans? Do you think China should support using nuclear weapons against the U.S.? Do you think China should learn from this ‘socialism with anti-Western characteristics’? Do you think this is none of our business? Responses from netizens largely focused on option two, with some eager to lead the charge themselves. Naturally, there were some quite constructive remarks reminding China to not let the nuclear enthusiasts take center stage. Some pointed out that if North Korea were to actually acquire nuclear weapons, China would suffer a lot, with its neighborhood peace destroyed. Moreover, as soon as North Korea gets their nuclear weapons, Japan will have every reason to conduct a comprehensive remilitarization, even to acquire its own nuclear weapons. There were also those who thought China will merely play a battle of words and will not actually enter into a U.S.-North Korea conflict, much less get involved in a nuclear war. Of course, some netizens were delighted to point out that Kim Jong-un’s Korea is the real successor to the communist ideal. However, when others reminded them that they could go over to North Korea and enjoy this for themselves, they immediately responded: this is absolutely none of my business! He dies suddenly due to a combination of diabetes, gout, and other diseases; North Korea goes through a chaotic period without a leader, then moves towards peace and order, finally completing the Korean reunification. The responses after this question were especially intense. The more gruesome options had their supporters, exposing the hostility circulating the web. But there was also a lot of hope for Comrade Kim Jong-un to be genuinely remorseful, thank his citizens for their support to the Kim dynasty, perform kind deeds, become enlightened, start “reform and opening up,” and at a suitable time peacefully release his power. From the responses of the netizens, whether we hate him or wish him well, we all know that Kim cannot continue down the path that he’s on. This is a strange phenomenon. In reality, North Korea was Asia’s most stable country in the last half-century. There was a peaceful, predictable transfer of power from each generation to the next. Sure, from time to time you’d hear about people dying of hunger or cruel methods for getting rid of disobedient servants, but at the end of the day there’s never been a genuine image of instability. But it’s precisely this type of regime that causes us readers deem it as unstable and ready for drastic change. It seems like the questions North Korea and the Kim dynasty most elicit from the world are these: How will you finally fall? How will North Korea change? Of course, for the Chinese people, it’s worth paying attention to how these challenges will affect China going forward. Meanwhile, to most Chinese, South Koreans are best known for Korean barbecue and television dramas. How is it that the North Koreans are so different? I leave my fellow netizens with the following thought: how does the relationship between people and systems relate to the good and evil inherent in human nature? The piece originally appeared in Chinese on Yang Hengjun’s blog. You can view the original here. History reveals China has neither the will nor the clout necessary to sway North Korea's decision making.